Should You Send an Email or Call? An executive I work with shared with me the frustration he was experiencing over a colleague. He learned that she was criticizing him and telling people that he was “out to get her”. He was frustrated and angry during our discussion. He had been working on being collaborative and this accusation of hers which she broadcasted to others seemed to come out of nowhere. As we worked to understand the circumstances, he reviewed the details. The last email he sent to his colleague was meant to give her a “heads up” that an issue falling under her responsibility was going to be addressed at an upcoming Executive Leadership Team (ELT) meeting. He had written in his email, “I want to make perfectly clear that I am trying to let you know what I heard…” He thought he was being a good citizen to let her know. When she received the email, she reacted in a way he didn’t expect. She was defensive about what her team had accomplished, blamed my client, and copied many people. Then he started hearing from people that she believed he was out to get her. She did not want the issue that he identified to be addressed at the next ELT meeting. She didn’t feel ready to do so and assumed my client put it on the agenda (which he did not). So where did my client go wrong? Well, we found a few places. The week before, he had learned that the budget he had anticipated had not been approved. And what’s more, he felt that his colleague’s team should give up some of her budget or a person from her team to compensate for a new role he needed filled that would benefit both of them. So he complained about the situation to her boss and to his own boss. She heard about the complaint (of course!) and she was angry and felt, “He is trying to throw me under the bus.” My client heard that she was upset, and so he chose to send the troublesome email assuming he was helping her. From her end, when she received his email, she read it with the perception that he was against her, even though it was not the case. What to do? My client needed to vent his disappointment and anger about losing resources. He then needed to speak with his colleague. Instead, they were conveying messages to each other through others rather than talking directly to one another. Once he calmed down, he was able to speak with her, give her empathy and recognize that it was not her fault that he did not receive the budget he wanted. He explained that he was actually trying to let her know that an issue important to her was going to be addressed at the ELT meeting and that he had not proposed the agenda item. They were able to communicate effectively and resume their positive relationship. As it turned out, they each were focused on different issues and had different views of their team’s responsibilities. As a result of their conversation, they were able to clarify and reconnect. They also came up with a solution to the budget and staff issue. When you know there is some disruption in a relationship, consider calling or talking in-person (when possible) before sending an email. It is so easy to read the tone of emails differently depending on our mood. It is useful to recognize our own mistakes, too. It may seem efficient to send an email and document. However, many issues have been cleared up with an open-minded conversation. In addition, relationships can be strengthened. Where would a call or a visit serve you today rather than sending an email? 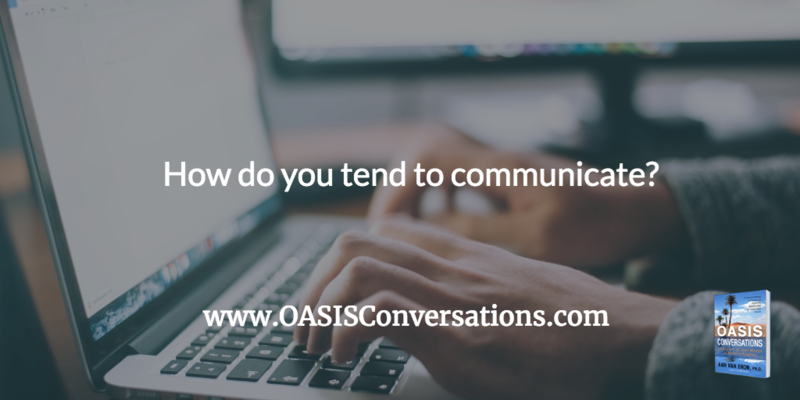 What lessons have you learned about communicating via email? This entry was posted in Change, Communication, intention, Perspective by Ann Van Eron. Bookmark the permalink.